The funk fans have recently “discovered” this West Coast 45 – but I don’t suppose many (any?) will have flipped it over to find a mini-masterpiece of deep soul. 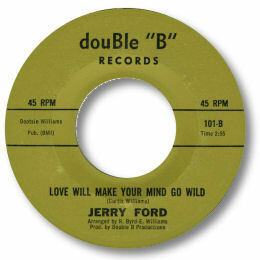 Love Will Make Your Mind Go Wild has an easy plodding rhythm over which Ford sings in a high baritone accompanied by excellent male background singers whose spot on harmonies and churchy interjections really lift the disc out of the ordinary. As do the horns at the end and the unusual occasional xylophone “plinks”. One that grows on you with each play. Late 60s? Early 70s? Does the fact that Dootsie Williams' name appears on the publishing credits mean the Dootone man was involved in this label/disc in some way? I would think so.